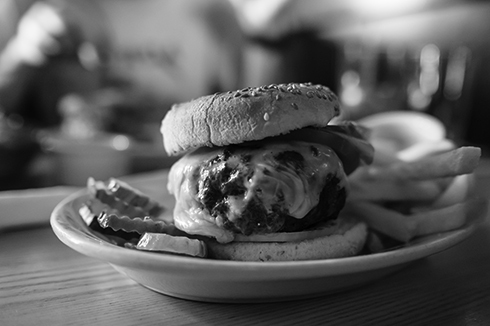 Five burger joints located around a two-mile radius of the City Ice Pavilion in LIC, NY. We kept every burger consistent to the same order: burger, American cheese, lettuce, tomato, onion and ketchup all cooked medium rare. Price includes fries and a drink. This corner spot has rock and roll flair with an interesting mix of industry spearheads, bikers with tattoos and everyday neighbors. Burger has burnt rim that separates flavor of the actual meat by giving complexity to the all-American burger, which by the way contains Master Purveyor meat; the same company that supplies beef to Peter Luger’s. This slap shot of flavor to the belly was the only one I was craving days later. It’s a diner in the most typical mass-produced way. Though the satisfying taste of meat and cheese does creep up on your palette, it’s a ubiquitous burger with nothing special other than sustenance. Fresh side ingredients and a healthy dose of half sliced pickle make up some ground, but with more bun to burger ratio, and what seems to be pre-packaged meat, this burger is more protein than pleasure. Find a McDonald’s, because torturing your stomach is better than this. 3. The Burger Garage $7.95 The most classic Americana feel out of all of them. Good selection of sauces and fresh ingredients in an automotive themed restaurant. The gooey American cheese banger we tried had the reminiscent taste of a cheesesteak with Shake Shack-esque texture. All of it’s wrapped in a utilitarian tinfoil, which keeps the burger warm and the juices contained. And with a blue-collar feel, there’s no pretention here, it’s just good eatin’. 4. Petey's Burger $9.20 This thin, yet tasty burger is a mix of charbroiled Burger King/McDonald’s hybrid wrapped in one. The atmosphere leaves much to be desired and the burger isn’t overwhelming at first, more it takes almost until the last bite to fully warm up and appreciate it. By that time you’re wishing you had opted for the double cheeseburger. Hand-cut fries are a nice touch, but the taupe “homemade” honey mustard sauce is too obscure for words—steer clear. 5. Corner Bistro $12.50 More baseball than hockey puck, this massive clump of meat has tons of juiciness, but taste can be hit or miss with a watery undertone present dependent on who’s running the line. (I hope you’re not pressing the meat down with that spatula)! The bun is like the t-shirt: a small outer layer that’s comfortable and not overwhelming but once saturated, offers no protection and disintegrates fast. 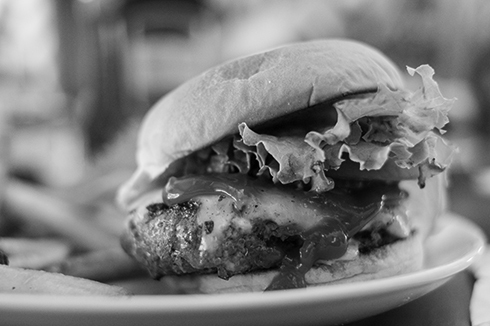 A lackluster amount of lettuce and tomato accompaniment offer nothing to protect the bun from the juice sweats. A good if not glorified bar burger.